Please see the Policies for Cores, Old Pumps Purchased, and Refunds below. Contact Us for more information. Core must be usable; all pieces/components must be contained in pump. Small deductions will be made for unusable items due to severe corrosion. Severely corroded or destroyed motors will not receive full refund. Checks will be issued for core refunds usually with in 3 days after we receive core at our facility. Refunds will not be made to credit cards or wire transfers. Have you seen old toilet and water pumps sitting in a corner or on a shelf at a marina, boat yard, flea market, or second-hand shop? We urge you to acquire these pieces and get them to us for CASH. Raz Marine stands ready with technical assistance in helping you with your Head Pump and Water Pump problems. 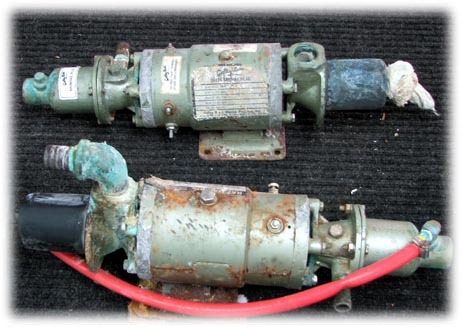 Contact Raz Marine for answers to your questions on Head pumps.